What’s goin on guys, Jerry Neutron here back with a brand new video. Today we’ve got a case on the review table, this is the In Win 303. I know this has been out for a couple of months now but due to some miscommunication it took a little bit to get into my hands. But I’m still gonna bring it to you guys here today, so this is my review. The In Win 303 is one of many cases to follow the tempered glass trend this year but the difference between this one and others is that it comes in at only $90 bucks. When you consider the cost of other tempered glass cases on the market this is actually one of if not the cheapest option. So let’s take a look at what you get for those $90 dollars. Up front you have a pretty minimalist, clean design with the front I/O extending down the right side of the case. There are 4 USB ports, two of them USB 3.0 which is great along with mic and headphones jacks and an In Win logo. The nice thing about this case is the I/O is LED backlit so when the system is powered on you get this pretty sweet looking but subtle glow up front. 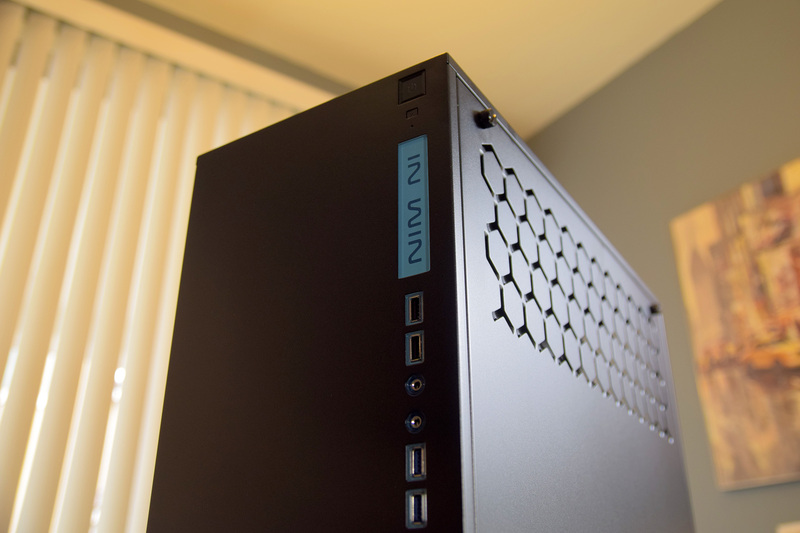 You’ll also notice there is no airflow coming into the case from up front which is a pretty interesting design choice. The 303 brings all of it’s intake in from the bottom of the case but we’ll talk about that a little bit later. Moving on to the left side we have this tempered glass side panel which also happens to be tinted, I’m a big fan of that. I also like the fact that you can remove the side panel by simply pressing down on this latch. For someone like me who swaps out hardware often or does various things with his PC, it’s so much more convenient than dealing with thumb screws. On the right side there is no tempered glass but you do have this ventilated side panel which acts as an exhaust for your system since the top of the case is sealed. Moving on to the back side of the case you can see the top mounted power supply which is rare for cases in 2016, a 120mm mount for an exhaust fan and 7 PCI slots, which are quite rattly. Now removing the side panel and taking a look on the inside you can see there is a large CPU cutout to help with installing CPU coolers, a couple cable routing holes although no rubber grommets which I really don’t like and three 2.5″ drive mounts although only two trays are included. As for cooling you’ll notice there are no fans pre-installed on this case which was likely done to keep costs down however the 303 supports up to 3x 120mm fans or up to a 360mm radiator on the top, 1x 120mm fan or 120mm radiator at the rear and 3x 120mm fans at the bottom. Underneath the bottom fan mounts is a removable dust filter which you can pull out from the side. Luckily you don’t have to lift this case to remove the dust filter as it’s quite heavy. As far as build materials go the 303 features the thickest steel I’ve ever worked with in a case and it makes the case feel rock solid. It’s probably the best feature of the 303 in my eyes and something you’ll notice if you go back to another competitors case. Anyway moving to the back side of the motherboard you can see two 3.5″ drive mounts, no cable tie-down points which is strange for a case of this size and price but there is ample room for tucking your cables in. 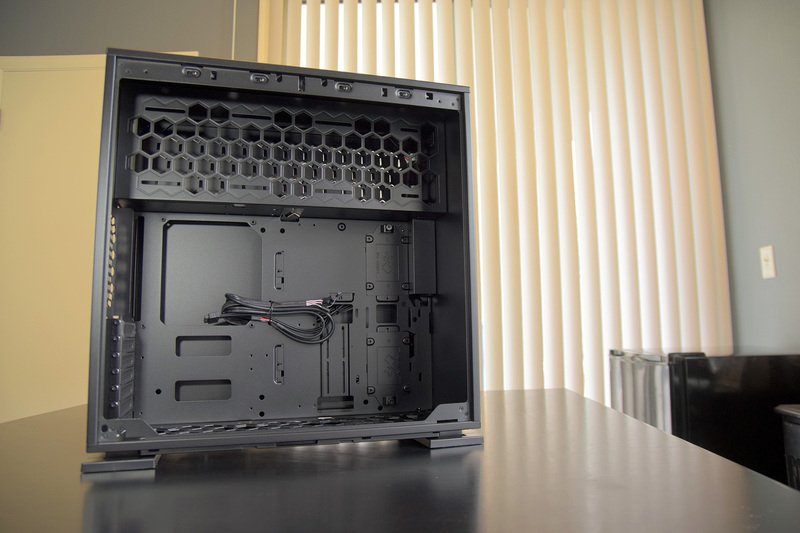 The 303 also features a PSU chamber which is on the top, that’s certainly different for a case these days. There are a couple of holes up there as well for cable routing although still no grommets which would have been appreciated. And that’s pretty much it as far as the tour goes so let’s throw a build in it, then I’ll let you guys know if I ran into any issues and what I think about the case. So here’s the system I put in the 303, you’ll have to excuse my mismatch color scheme as these were the only 120mm fans I had lying around. 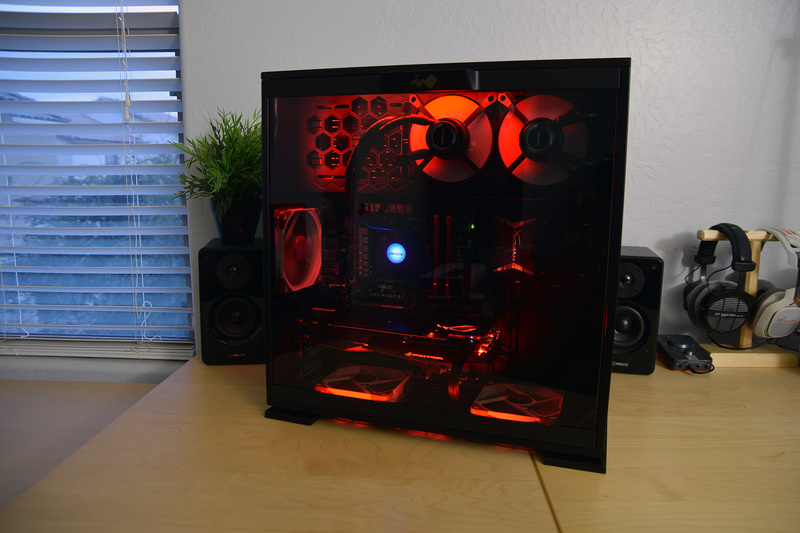 I also decided to throw some red LEDs in the case just to spice it up a little bit. 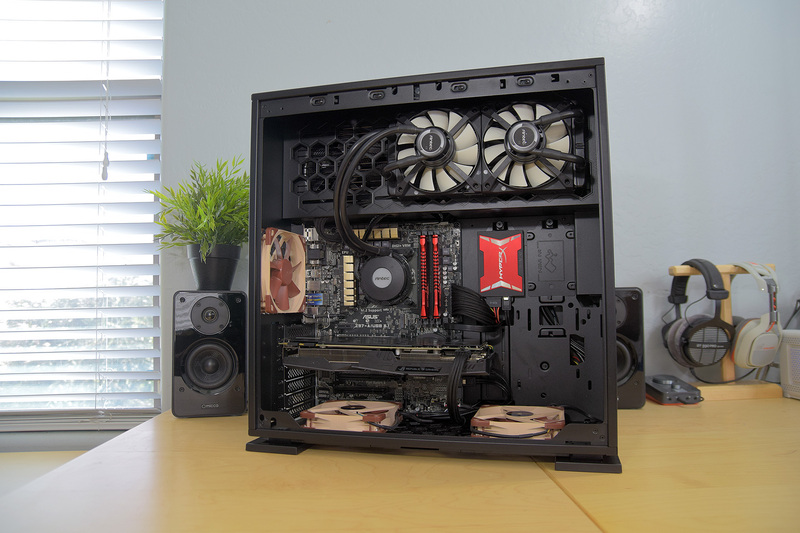 So building in the case there are a few things that I do want to comment on but the biggest issue I ran into is the mounting of the intake fans. Not only do the fans block your bottom PCI slot but they also put your front panel connectors at a very awkward angle and I’m not sure how In Win decided that this was a good design choice. 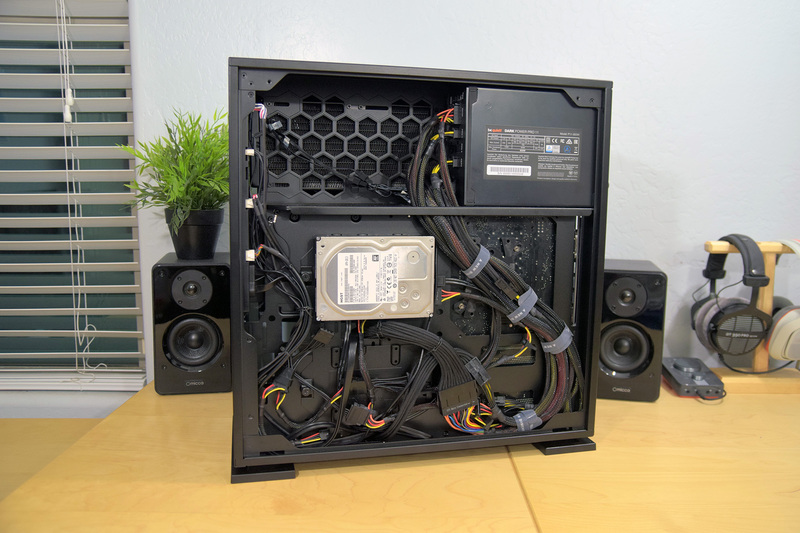 An extra 30mm of space between the motherboard and floor would have given the clearance to mount the fans without issue and it also would have given the option for cable routing holes for those front panel connectors. You may have better success using fans with rounded frames but overall this is a terrible setup. To top it off In Win requires you to remove the case feet anytime you want to install fans which is an annoyance all on its own. Also due to the lack of intake at the front you end up with wasted interior space that could have gone to radiator or fan mounting. Speaking of radiators, the 303 does support up to a 360mm rad up top although installing one will block the intake fan for your power supply so I’d recommend sticking to a 240mm one. In Win also missed an opportunity here to support 140mm fans or 280mm rads which as far as I can tell, there is no reason to NOT support them other than the lack of mounting holes. Moving to the back of the case you can see my cable management which is OK, not great. Some cable-tie points would have been nice but as I mentioned earlier at least there is some room to tuck the cables in. I do wish they had a slightly different drive mounting solution here as installing these large 3.5″ drives does interfere with cable routing just a bit as they both sit really close to the routing holes. But overall this is a great looking case, probably one of the best looking tempered glass cases on the market at this point. Unfortunately it suffers from some questionable design choices which make this case hard to recommend. And that’s how I feel about the #InWin 303, it’s beautiful on the outside, ugly on the inside and you should consider the 805 instead or look towards a different tempered glass case manufacturer altogether. So that’s about it guys! Let me know what you think in the comments down below, don’t forget to like this video if you enjoyed this type of content, subscribe if you haven’t already, don’t forget to follow me on Twitter @JerryNeutron and until next time…see ya!